Musical revues are tricky theatrical productions. How do you create a framework for songs taken out of context, or in the case of the music of Irving Berlin, sift through the vast catalog of classics written over the course of his seven-decade career? For "Irving Berlin's I Love a Piano," playing at the Cutler Majestic Theatre through this weekend, creators Ray Roderick and Michael Berkeley came up with an odd, but very clever gimmick: an upright piano with one bad key that follows Berlin's musical career from the early 20th century through the 1950s. The metaphor for the brilliant piano man is apt, and creates the through-line needed for this chronological collection of Berlin's songs. Roderick and Berkeley clearly had fun selecting the 60 songs they include in the show, which range from the familiar "Always," "White Christmas," and "There's No Business Like Show Business" to the quirky "Pack Up Your Sins and Go to the Devil," "Snookie Ookums," and the haunting "Russian Lullaby." They group the songs around a series of scenes that capture a certain feel for a decade (a music store to start out, a speakeasy, a dance hall, the Stage Door Canteen for the war years). The songs never feel as if they've been forced into their theme. Berkeley's musical medleys keep the tunes moving quickly and the creative pair smartly limits the between-song patter. Six singer/dancers - Mark Baratelli, Sean Schwebke, Summer Broyhill, Johnnie Moore, Darcie Bender, and Karla Shook - move easily through the music, and although the vocal arrangements don't always flatter them, they deliver the series of sketchy character portraits with enthusiasm and high energy, an essential ingredient in this mix. Roderick's choreography is simple but crisp and colorful. The high point for the dance came with a series of songs set in a movie theater. As the singers sit in their "theater seats" reacting to imaginary movie moments, they are also singing "Let Yourself Go" and "Change Partners." Then they start dancing, first simple steps in place and then more elaborate moves with partners. Roderick also works in routines that reference Fred Astaire and Ginger Rogers during "The Best Things Happen When You're Dancing," as well as the famous hobo scene performed by Astaire and Judy Garland for "We're a Couple of Swells." He stages the big act one finish with Shook doing her imitation of Kate Smith singing "God Bless America." The star of this production is the nine-piece band, under the direction of Newton native Alex LeFevre. Although the piano is always at the heart of the sound, there's a rich mix of instruments that get a chance to stand out, including a banjo for "All By Myself," violins in "Blue Skies," and a range of percussion used by both the singers and the orchestra. Yes, "I Love a Piano" leans toward hokey, and is just the kind of musical revue that will do better on a national tour than Broadway, but Roderick and Berkeley have captured both the astonishing range of Berlin's musical styles and the cleverness of his simple rhymes, which makes it easy to understand why the songwriter remains a national treasure. Conceived by Ray Roderick and Michael Berkeley. Directed and choreographed by Roderick; musical arrangements by Berkeley. 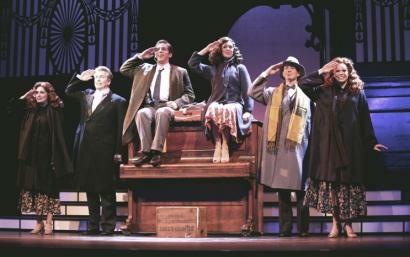 Scenery designed by Larry Gruber; lighting, Ed McCarthy; costumes, Sam Fleming. At: the Cutler Majestic Theater, through Sunday.